“G-BOMBS” is an acronym you can use to remember the most nutrient-dense, health-promoting foods on the planet. These are the foods you should eat every day, and they should make up a significant proportion of your diet – these foods are extremely effective at preventing chronic disease and promoting health and longevity. Raw leafy greens contain only about 100 calories per pound, and are packed with nutrients. Leafy greens contain substances that protect blood vessels, and are associated with reduced risk of diabetes.1-3 Greens are an excellent tool for weight loss, since they can be consumed in virtually unlimited quantities. Leafy greens are also the most nutrient-dense of all foods, but unfortunately are only consumed in miniscule amounts in a typical American diet. We should follow the example of our closest living relatives – chimpanzees and gorillas – who consume tens of pounds of green leaves every day. The majority of calories in green vegetables, including leafy greens, come from protein, and this plant protein is packaged with beneficial phytochemicals: Green vegetables are rich in folate (the natural form of folic acid), calcium, and contain small amounts of omega-3 fatty acids. Leafy greens are also rich in antioxidant pigments called carotenoids, specifically lutein and zeaxanthin, which are the carotenoids known to promote healthy vision.4 Also, several leafy greens and other green vegetables (such as bok choy, broccoli, and kale) belong to the cruciferous family of vegetables. Nuts and seeds contain healthy fats and are rich in a spectrum of micronutrients including phytosterols, minerals, and antioxidants. Countless studies have demonstrated the cardiovascular benefits of nuts, and including nuts in the diet aids in weight maintenance and diabetes prevention.32-35 The nutritional profiles of seeds are similar to nuts when it comes to healthy fats, minerals, and antioxidants, but seeds are also abundant in trace minerals, higher in protein than nuts, and each kind of seed is nutritionally unique. Flax, chia, and hemp seeds are extremely rich sources of omega-3 fats. In addition to the omega-3s, flaxseeds are rich in fiber and lignans. Flaxseed consumption protects against heart disease by a number of different mechanisms, and lignans, which are present in both flaxseeds and sesame seeds, have anti-cancer effects.36-38 Sunflower seeds are especially rich in protein and minerals. Pumpkin seeds are rich in iron and calcium and are a good source of zinc. Sesame seeds have the greatest amount of calcium of any food in the world, and provide abundant amounts of vitamin E. Also, black sesame seeds are extremely rich in antioxidants.39 The healthy fats in seeds and nuts also aid in the absorption of nutrients when eaten with vegetables. You can learn more about the health benefits of G-BOMBS (formerly referred to as GOMBBS) in my best-selling book Super Immunity, which discusses how to naturally strengthen the immune system against everything from the common cold to cancer. Stringham JM, Bovier ER, Wong JC, et al. The influence of dietary lutein and zeaxanthin on visual performance. J Food Sci 2010;75:R24-29. O'Keefe SJ, Ou J, Aufreiter S, et al. Products of the colonic microbiota mediate the effects of diet on colon cancer risk. J Nutr 2009;139:2044-2048. Shan BE, Wang MX, Li RQ. Quercetin inhibit human SW480 colon cancer growth in association with inhibition of cyclin D1 and survivin expression through Wnt/beta-catenin signaling pathway. Cancer Invest 2009;27:604-612. Ravasco P, Aranha MM, Borralho PM, et al. Colorectal cancer: can nutrients modulate NF-kappaB and apoptosis? Clin Nutr 2010;29:42-46. Shin A, Kim J, Lim SY, et al. Dietary mushroom intake and the risk of breast cancer based on hormone receptor status. Nutr Cancer 2010;62:476-483. Joseph JA, Shukitt-Hale B, Willis LM. Grape juice, berries, and walnuts affect brain aging and behavior. J Nutr 2009;139:1813S-1817S. Stoner GD, Wang LS, Casto BC. Laboratory and clinical studies of cancer chemoprevention by antioxidants in berries. Carcinogenesis 2008;29:1665-1674. Krikorian R, Shidler MD, Nash TA, et al. Blueberry supplementation improves memory in older adults. J Agric Food Chem 2010;58:3996-4000. Shahidi F, Liyana-Pathirana CM, Wall DS. Antioxidant activity of white and black sesame seeds and their hull fractions. Food Chem 2006;99:478-483. If desired, the remaining 10% of the diet can contain small amounts of foods with lower nutrient to calorie ratios, such as animal products, sweets, and processed foods, as shown toward the top of the pyramid. By keeping these low nutrient foods to a minimum and striving to eat at least 90% of calories from the unrefined plant foods that comprise the base of the pyramid each day, you construct a health-promoting, disease-preventing diet. This high nutrient eating style is considered a Nutritarian™ diet. The USDA Choose My Plate icon has replaced the USDA Food Pyramid and does put more emphasis on the consumption of vegetables and fruits, but it still has some fundamental flaws. 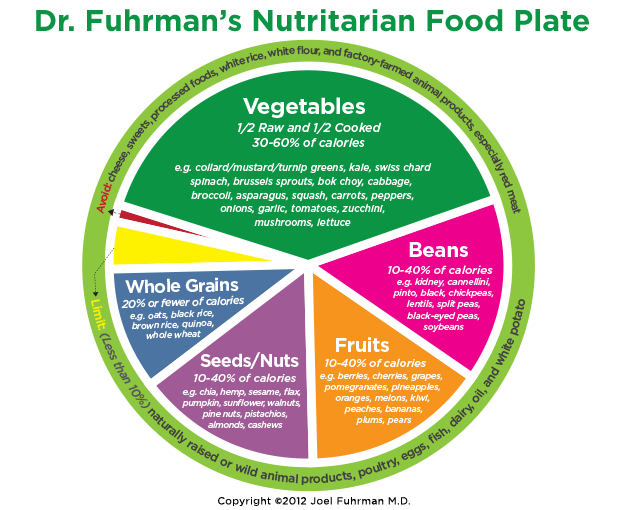 That is why Dr. Fuhrman created the Nutritarian Food Plate to emphasize the most nutrient-rich foods that should fill up your plate. The USDA pyramid allows for multiple servings daily of dairy, meat, and oils – nutrient poor foods that should be limited to 2 or less servings per week in Dr. Fuhrman’s Pyramid. These foods do not contribute beneficial micronutrients and therefore do not deserve such prominent positions in the diet. For example, the USDA pyramid recommends approximately 3 servings of dairy per day for adults. Dairy products are not essential for good health, and contribute saturated fat and animal protein, both of which should be limited to prevent chronic disease. The USDA pyramid places the most emphasis on grains, whereas Dr. Fuhrman’s pyramid places the most emphasis on vegetables. They recommend that half of grain servings each day are whole grain rather than refined – this leaves too much room for dangerous refined carbohydrate products in the diet, and less room for fruit and vegetable servings. Although whole grains are healthful, their nutrient density is not as great as those of the other unrefined plant foods. In Dr. Fuhrman’s pyramid, whole grains can be included daily, but are limited; fresh fruits, vegetables, and beans, because of their high nutrient to calorie ratios, can be eaten in unlimited quantities. The USDA pyramid combines meat and beans into one category. Both meat and beans are sources of protein, but it is important to differentiate between these since meat is a disease-promoting food and beans are a health-promoting food. The protein in meat is packaged with saturated fat and cholesterol, and the protein in beans is packaged with fiber and phytochemicals. Meat contains no fiber or phytochemicals. Beans help you maintain your weight by promoting satiety, protect against cancer, and help to keep cholesterol levels down. 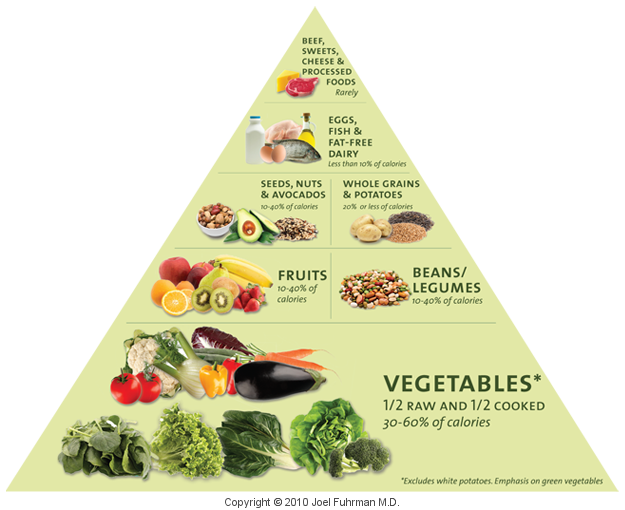 In Dr. Fuhrman’s pyramid, beans are eaten daily and meat is limited to two servings or less per week. The USDA pyramid does not convey the importance of nuts and seeds for good health – there is no ‘nut and seed’ food group. Nuts and seeds are also included in the meat and beans cateogy. In Dr. Fuhrman’s Pyramid, nuts and seeds are included every day because of their potent cardiovascular benefits. Because of their calorie density, they should be limited for individuals trying to lose weight.